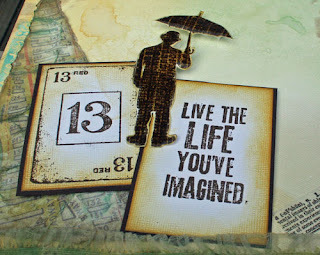 Today's post at Kat Stamps. 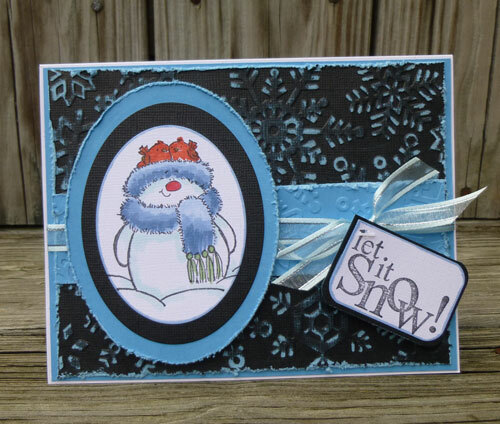 ﻿It's never too early to create cards for upcoming holidays because holidays seem to creep up on us. I found this paper in my stash and knew it would work well with the Marion Stamp. She's a little saucy with those big eyes don't you think! I lightly colored her with Copic Markers, then added gold Spica pen to her fins because I wanted a little shimmer. I then added a touch of red to her eyes and nails. 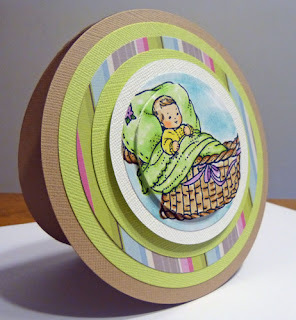 I chose to cut Marion out and place her on a background created with Spellbinders Oval dies. My inner child has been freed! I've discovered Faber Castell's fabulous Gelatos and let me tell you they are so much fun to work with!! 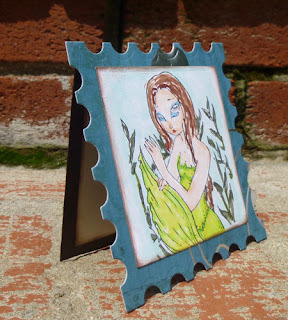 If you haven't tried them yet, you are in for a treat because they are easy to use and you can blend the colors with your fingers or create a water colored effect using a paint brush and water. Plus they come in tons of fabulous colors. Using a shipping tag, I rubbed purples and blues randomly on the tag. Using my finger, I rubbed the colors into the tag. Then I spritzed the tag lightly with water and scribbled some silver on top. I worked the colors in with my fingers. 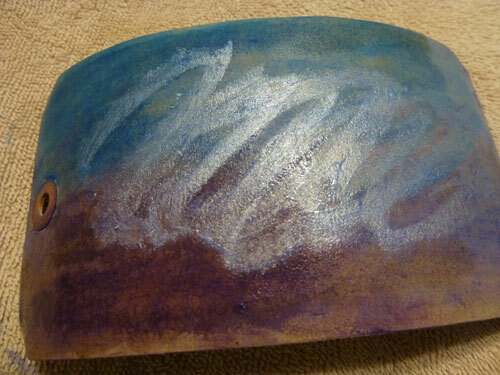 Since I wanted a more even effect, I used a paintbrush and water to move the colors around the tag. I love that the colors are opaque. Your project does not get muddy when you continue to add colors. 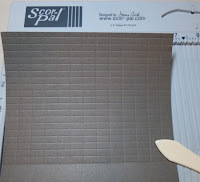 At this point I dried my tag with a heat gun and then added more silver along the edges and gently worked the color from the edges into the tag. 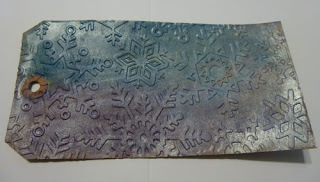 Next, I used a Cuttlebug Snowflakes Embossing Folder on my tag. Love it! 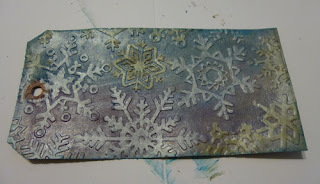 For a little more emphasis, I rubbed silver and gold lightly over the snow flakes and some blue along the edges of the tag. I gently rubbed in the blue to highlight the edges. 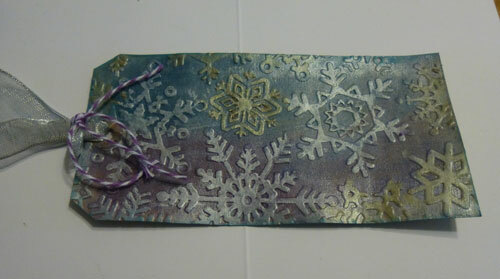 A silver ribbon and some twine were added to finish off this tag. I'm thinking this tag would look great on a gift bag, or even on a card. If you want to release your inner child, pick up some Gelatos today and start playing. I have so many different projects in mind and I can't wait to pick up more colors. 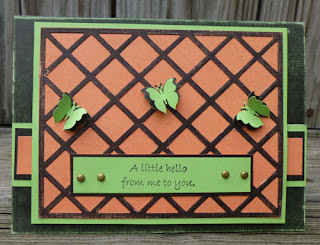 It's a new challenge at Cornish Heritage Farms and Dianne has challenged us to create with circles. Every element of this card was made with circles. I chose to work with this awesome Baby Basket image from CHF. I began by creating the card from Bazzill cardstock and Spellbinders Grand Nestabilities and Large Circle dies. 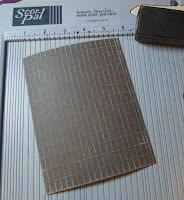 Each layer was then cut with the next smaller die until I had all the layers cut. I added a touch of Momenta pattern paper as a layer to add an additional pop of color. 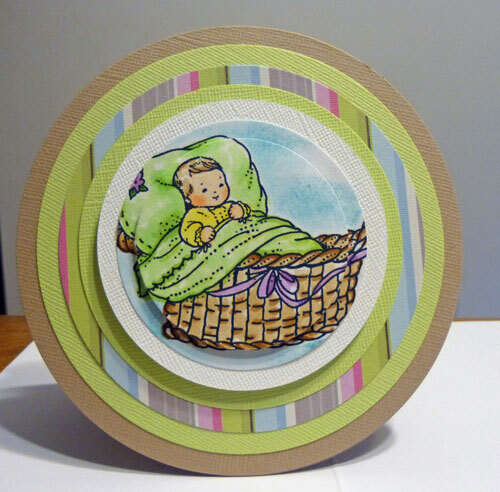 The baby image was colored with Copic Markers and Ranger Distress Ink was sponged around the image. Using the circle dies, I cut the image into 2 pieces and reassembled the central image with foam adhesives onto white cardstock. 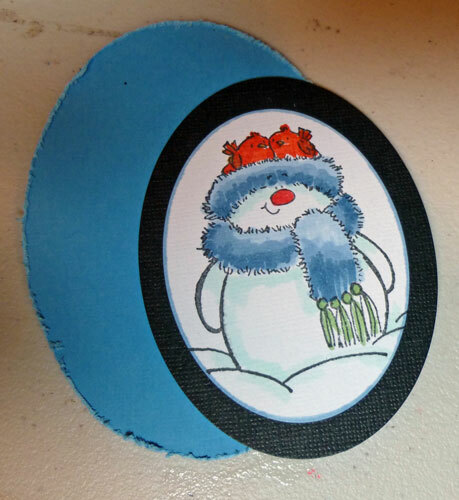 This piece was then added to the card front with additional foam adhesives. I love how something as simple as circles can make your project pop. 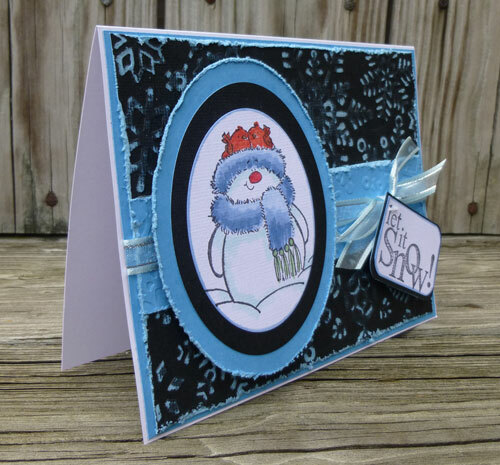 Don't forget to check out what the others designers have created for this challenge. You can see the complete designer list here: Cornish Heritage Farms. It's summer and it's time for a party - and doesn't a party need it's own set of awesome ideas (besides the food, I mean). 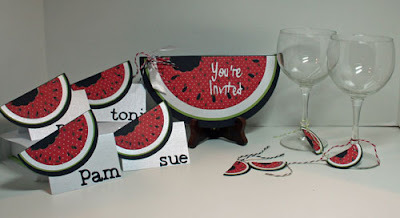 Let's talk invitations, placecards and wine charms. Check out this collection I created for www.scrapbookpal.com this month!! Let's start with the invitation. 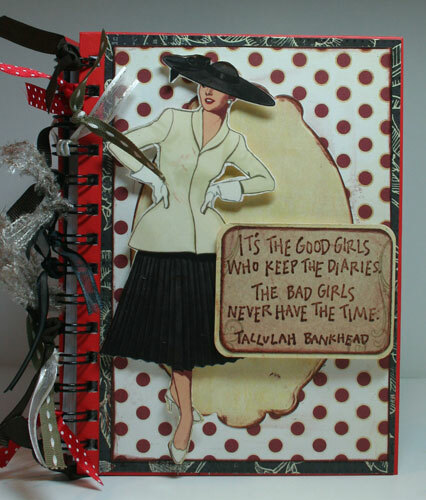 I used black, green and white Bazzill cardstock and Creative Imaginations pattern paper. The watermellon shape layers were cut from the Just Because Cricut Cartridge at 7 3/4". 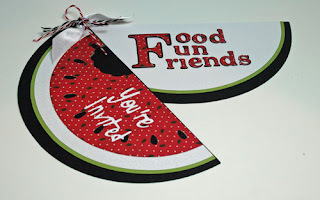 To make the watermellon more lifelike, I took a "bite" out of the top layer with a Spellbinders dies. "You're Invited" was cut from the Calligraphy Cartridge. Rather than adding invitation details (which you can easily do) I chose to create the words you see here from the Plantin Cricut cartridge using Bazzill cardstock and Creative Imaginations pattern paper. 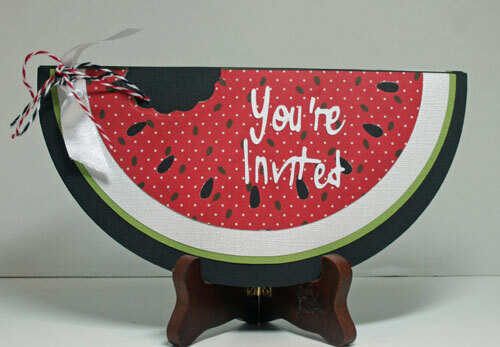 Then I punched a hole in the upper left corner and added some ribbon and twine which allows the watermellon to swing out. 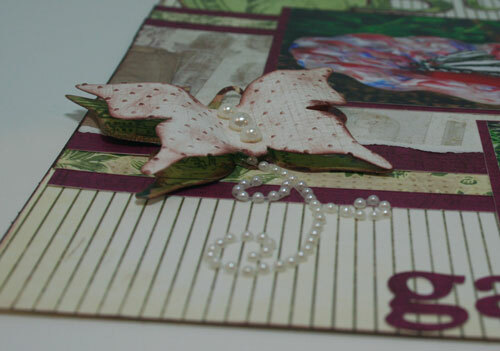 Now that the invitation was complete, I decided to create place cards. 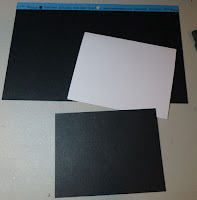 Using white cardstock, I cut each place card 2" x 4" and scored them in half to create 2" x 2" place settings. The watermellons were cut as shown above, but at on a smaller scale at 3". The names were cut from Plantin at 1 1/2". I think I had the most fun with the wine charms. 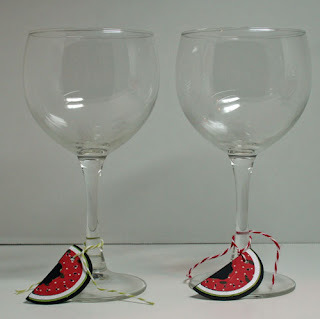 Once I figured out how to let the guests distinguish their glass from the others, I cut the watermellons at 2", punched a hole in the corner and added different colors of Twine. 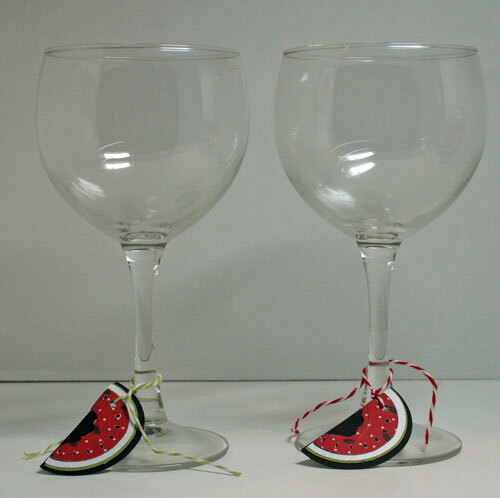 The assorted colors of Twine will help your guests remember which glass is theirs! I had a lot of fun creating these party element. Just think of what you can do for your next party. Thanks for stopping by today. 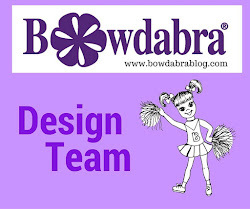 And don't forget to stop by the blog and see what our other designers have been creating. And, remember that orders over $25.00 ship free and usually within 24 hours. 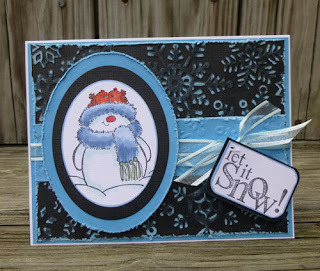 This is today's post at www.katstamps.com. 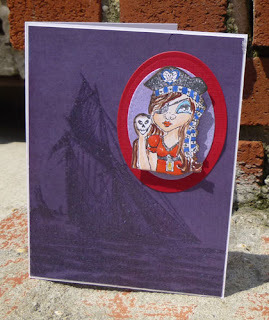 I'm using the Swashbuckler stamp by Christina Lynn Myers. I recently found these little glossy bags in my stash and thought this image was a perfect fit for the bag. The bag may be small, but think of all the little treasures you can put in it. 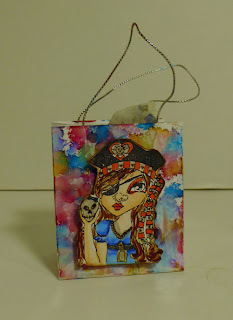 Using Ranger Alcohol Inks, I inked up the bag, including the sides. Alcohol Inks work great on glossy paper and this bag really loved them. I stamped my image and colored her with Copic Markers. 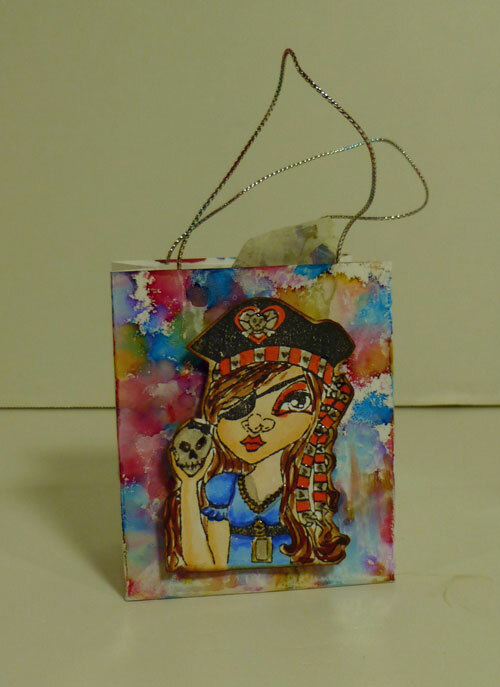 Then I cut her out, but before placing her on the bag, I added some Glossy Accents to the skull, her necklace and her hair ribbons. 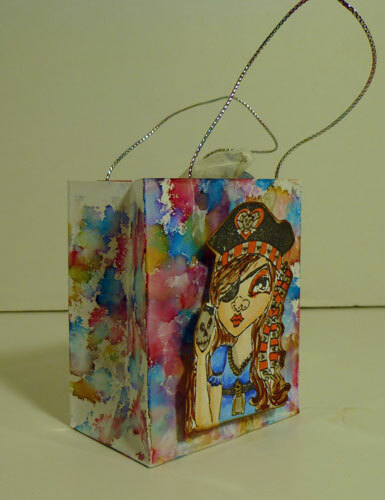 I added the image to the bag with foam adhesives so she'd stand out. 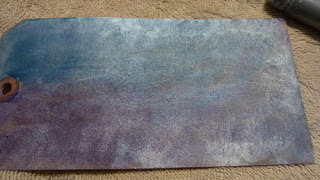 It's a little hard to tell, but I also used Alcohol Inks on the tissue paper I put inside the bags. 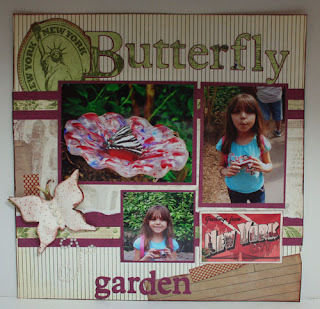 These are some of the DT projects I created this month with a fabulous kit: My Minds Eye - Miss Caroline - Dilly Dally from Fotobella.com. The color combination is gorgous. This collection includes blues, yellows, tans, greys, greens and a pop of red alongside some amazing weathered wood patterns to create an awesome collection to work with. The colors work so well together. 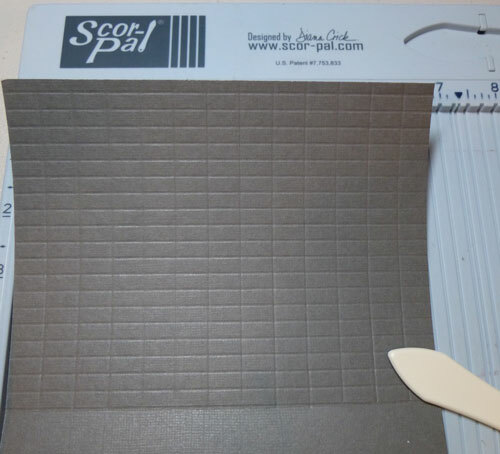 It was easy to create some beautiful cards with these papers. The dimensional embellishment are beautiful and self-adhesive! 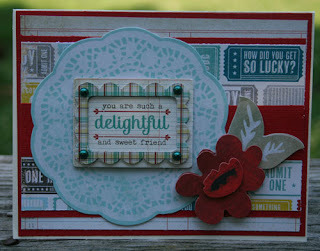 The large sticker doily and assorted dimensional adhesives had this card together in no time at all! This collection even included a wood element onto which I adhered some bling and a sentiment using the coordinating stamp set. 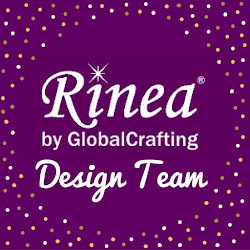 I submitted these projects for the DCWV design team call. Alas, I did not make the team, but I do love their stacks. 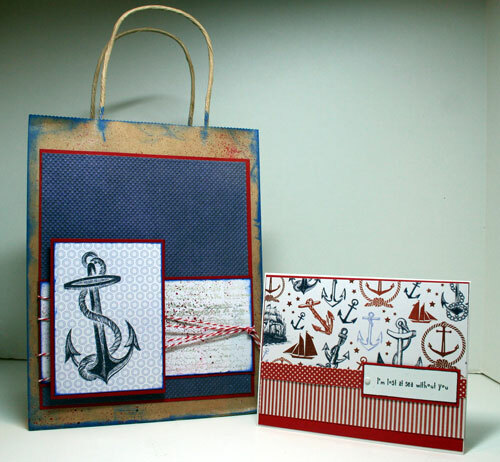 This Nautical Stack was perfect to create a card and matching gift bag. Wouldn't this make a great gift set for someone special? 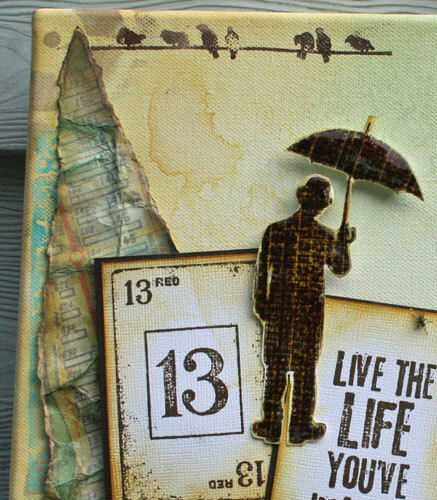 Cutting apart elements from the paper and then popping them on the page (or book) makes them stand out. 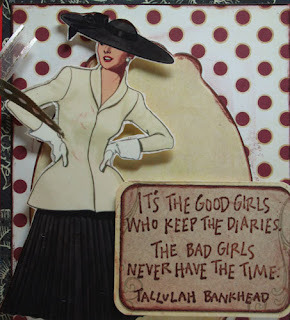 I love cutting apart elements from different papers and including them in a layout. 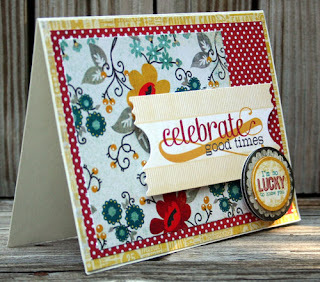 This is today's post at www.katstamps.com. I'm using Swashbuckler stamp by Christina Lynn Myers. This Gal would make anyone's head turn. I created a sea background of alcohol inks on glossy cardstock trying to convey a sense of movement in the background. I cut the treasure chest with my Cricut and then inked the edges to "age" the chest. I colored the stamped image with Copic Markers and then cut her out and placed her on top of the chest. Doesn't it appear as if this Gal has found a wonderful treasure in this chest? 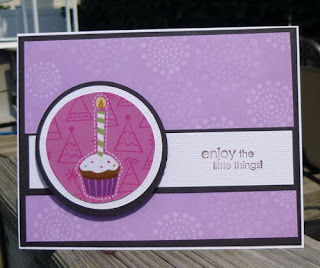 I'm loving the Birthday Glitter Paper from Momenta. 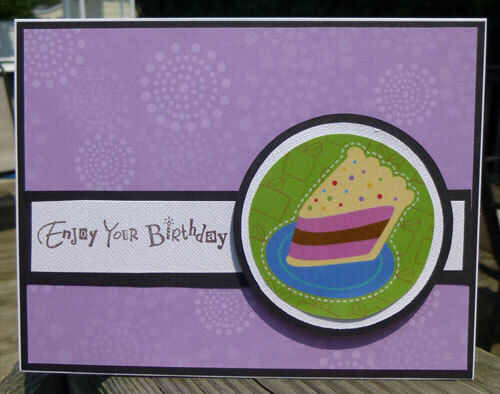 It is the perfect paper to use when creating birthday themed projects. 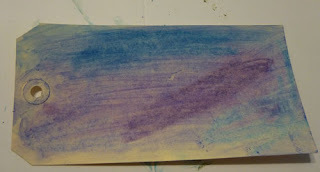 I chose to use the reverse (purple) side for the base of my card. Using Spellbinders dies, I cut out birthday cakes and used them on top. 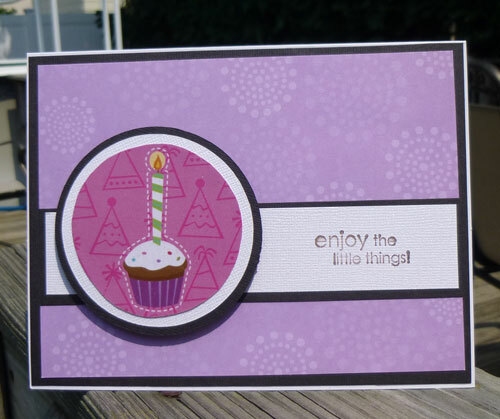 The sentiments were stamped with Clearsnap Ink. I was lucky enough to work with Queen Kat's Marion stamp this month. She was created by Terra Bidlespacher for Kat Stamps and I love that she is tucked into the surrounding greenery. 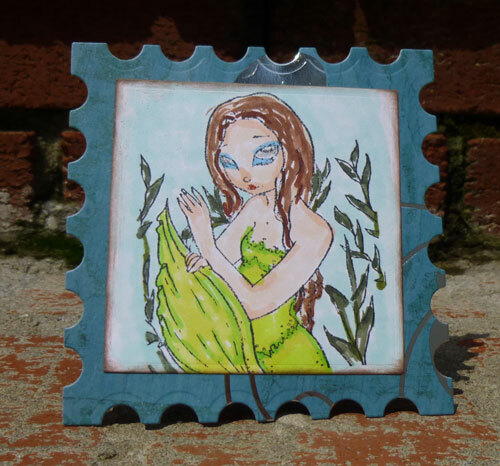 This stamp is a little bit larger and lend itself well to a square shape. I colored her with Copic Markers and used some light blue for the surrounding sea. Doesn't she look like she could be a postage stamp? Using Spellbinders dies, I cut the image into a square and cut the background from a postage die - love the added texture this gives my card. 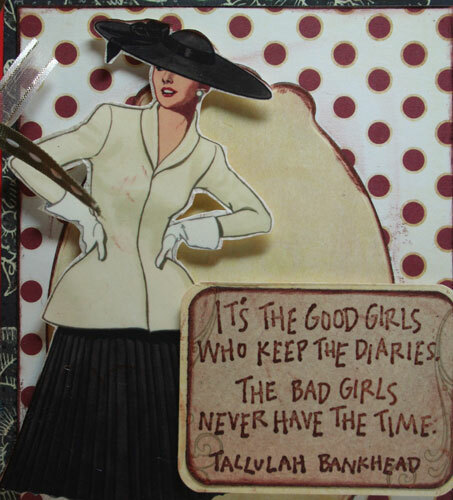 I created a 3" x 3" card from brown cardstock and added my postage stamped image on top. 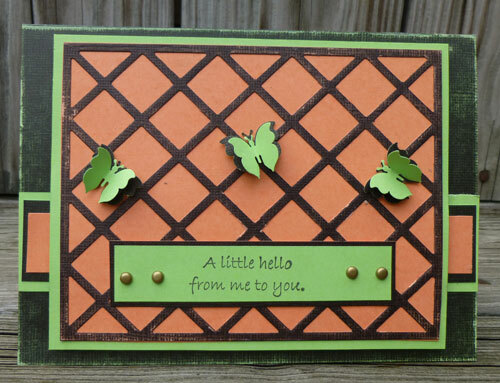 I'm thinking this would be a great little "thinking of you card". Don't forget to check out the amazing stamps here. 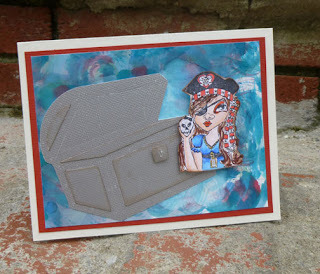 I had a fun stamp called Swashbuckler by Christina Lynn Myers to work with this month from Katstamps. I colored her with Copic Markers and Spica Pens (for a little shimmer), then cut her out and mounted her onto some awesome paper from DCWV. Isn't she the perfect image for this paper? Love the skull she is holding in her hand, don't you? 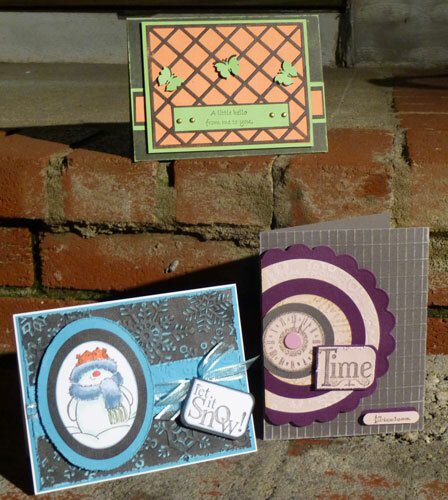 Stop by the Katstamps store and check out all the stamps available. 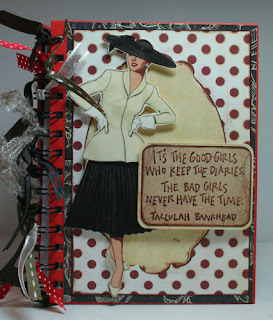 This is today's project at Scrapbookpal. 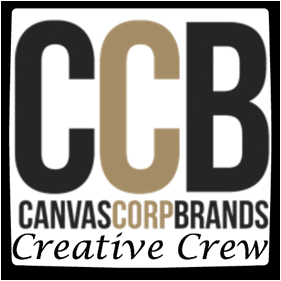 Working with canvas allows you so many opportunities to create something very different that you can use as a showpiece. I had no plan in mind when working with this canvas, so I dug out all things "Tim" - stamps, paper, inks and masks- and went to work. I began by using the Inking Tool and inked the canvas with Spiced Marmalade, Wild Honey, Antique Linen and Broken China, being sure to rub the tool into the canvas with a rotating motion to avoid stroke marks. Once I had the effect I wanted, I ran my fingers under the faucet and shook my fingers over the canvas. I continued adding drops of water until I saw the water pooling on the canvas, then I put the canvas aside to dry. Using Perfect Pearls, I inked some ribbon with Mixed Media Adhesive then attached it to the bottom of the canvas with Glossy Accents. I added a silver charm to the right corner. I used assorted masking elements, appling the masks to three areas of the canvas and inking over the masks with Walnut Ink. The design was revealed once I removed the masks. 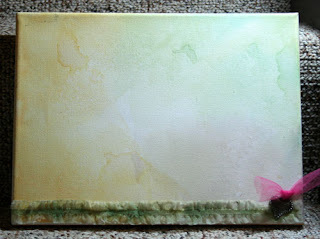 I then added several strips of tissue tape to the right side of the canvas. The translucent tapes allow the colors on the canvas to show through. 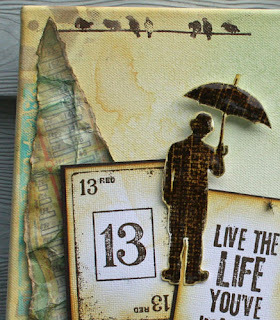 I stamped the Umbrella Man with Walnut Ink on white cardstock. After cutting it out, I covered it with Glossy Accents. I put this piece aside to dry while I worked on the rest of the canvas. 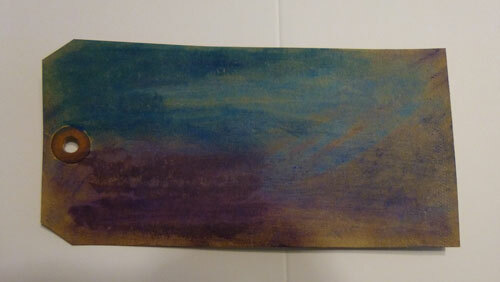 I stamped a strip of birds in the upper left section of the canvas with Walnut Ink. Because I was stamping on canvas, the image itself was not be complete (see bird #4), but that is absolutely fine! I tore a piece of pattern paper, crumpled it and thoroughly wet it. Once it has dried, I gently pulled it back to form, leaving it somewhat wrinkled, then inked over the paper with Walnut Ink so that the ink just touched the wrinkled areas. Using the mini misters, I then spritzed the paper again with water just until the ink started to run. Allow the paper to dry and then ink the edges with Antique Linen Linen and Wild Honey. Add this piece to canvas wth Glossy Accents. I then stamped several images with Walnut Ink on white cardstock and cut them out. Using the inking tool, I inked each with Antique Linen and Wild Honey, and then matted them with brown cardstock. 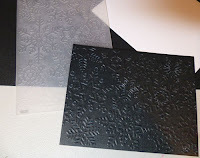 To keep them close, I stapled them together and then added them to the canvas with foam adhesives for dimension. 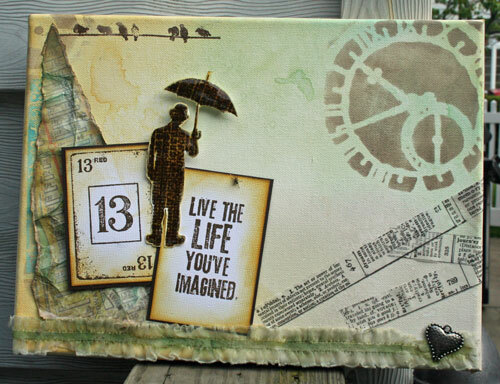 I then placed the Umbrella Man between the two images with foam adhesives. Using Wild Honey, I dragged the ink pad directly along the edges of the canvas for a bright, distressed effect. For a more subtle effect, I could have used the inking tool. FYI, I pulled out the pink ribbon when I completed this project as it really didn't coordinate with the ultimate colors I chose for this project. I began by cutting my cardstock to fit my card front, then cutting another piece slightly smaller to fit on top. I embossed the smaller piece with a Cuttlebug Snowflake Embossing Folder. 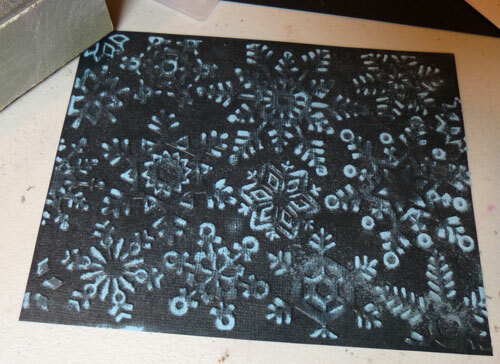 Using a sanding block, I then sanded the snowflakes so the under side (the blue) would show through. 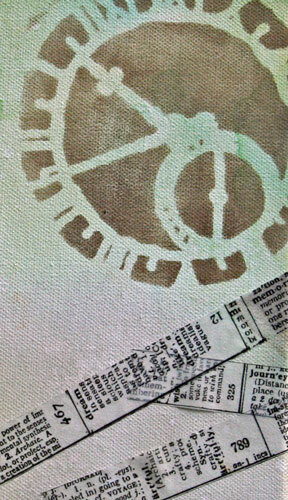 Then I lightly distressed the edges for the same effect. I also embossed a smaller piece of cardstock and lined up the snowflakes on top of the base. 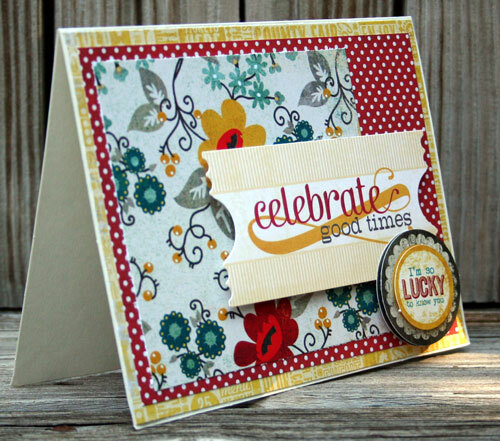 The Penny Black image was stamped with Memento Ink and colored with Copic Markers, then the oval circles were cut with Spellbinders dies. A ribbon was tied around the card and the image was placed on top. Foam adhesives were added for dimension. 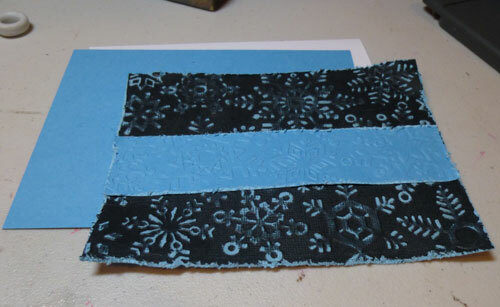 To finish the card, a Penny Black sentiment was stamped and then matted and attached to the ribbon with a Paper Tagger. 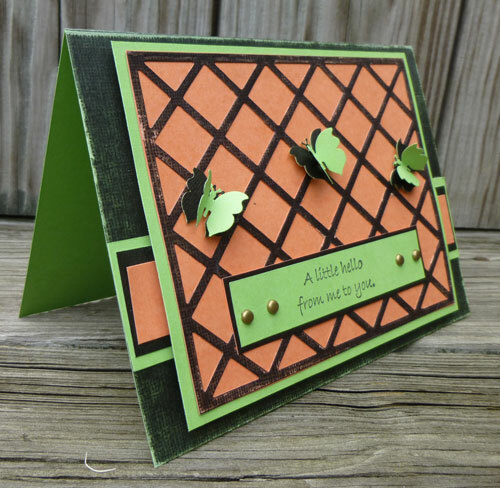 I began by creating a card from Core, then, using my Scor-pal, I created the background by scoring every 1/2". Flipping my card 90 degrees, I then scored again every 1/2". Once scored, I used a sanding block to distress the edges. I die cut a large scalloped circle and a large circle. 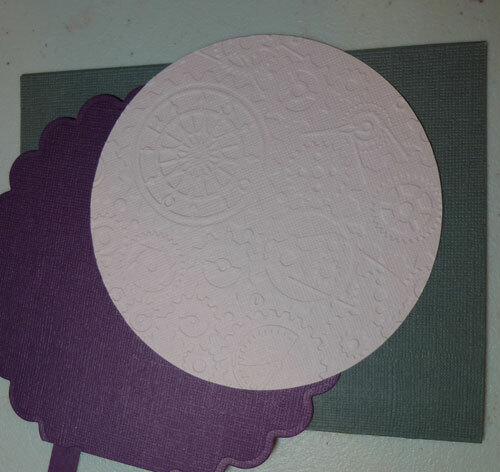 The large circle was embossed with a Cuttlebug Embossing Folder. 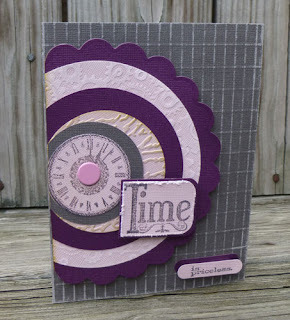 I cut 4 smaller circles in assorted colors and stamped a clock on the smallest one and embossed another. A large brad was placed in the center for some visual interest. After assembling all my elements, I cut away the left side. 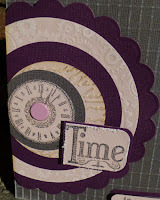 "Time" was stamped, distressed and matted, then added to the card front with foam adhesives. 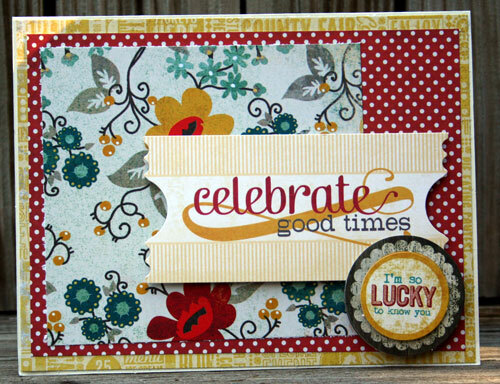 "is priceless" was stamped and punched out and added to the lower section of the card front with a coordinating mat. 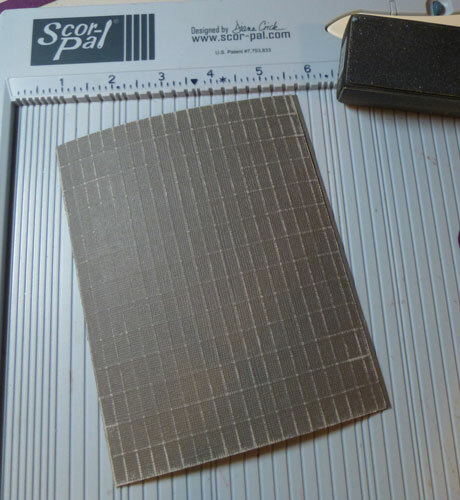 A card was created by cutting Core 10" x 6 1/2", then scoring at the 5" mark. The card was folded and sanded to allow the under side to show. The grid was die cut with a Cheery Lynn die and then lightly sanded. It was then adhered to the orange cardstock and then matted with green cardstock. 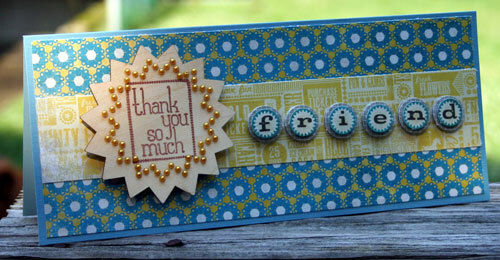 A sentiment was stamped and added to the front with brads. A border of green, black and orange was placed on the card before adhering the panel. 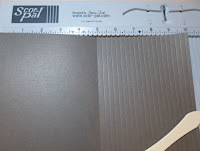 Foam adhesives were added to give the panel some height. 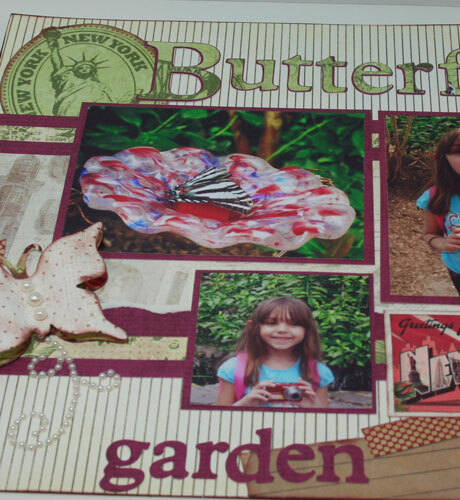 Little butterflies were punched and added to the grid.